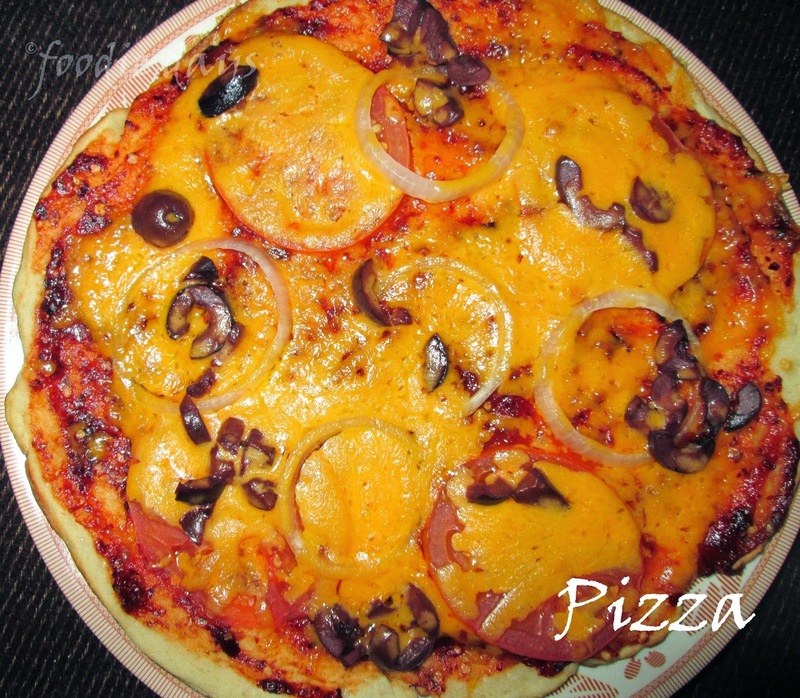 I am sharing a tasty recipe 'Pizza'.I know every one like pizza,you can make it in your home.If you do not have an oven you can make it with your frying pan.This is a vegetarian pizza.You can use different toppings for it.Most of pizza needs mozzarella cheese,but I use cheddar cheese for this. It is tasty and yummy.Let us know how to make it. Black Olives-10 to 15 numbers. Cheese-Grated-1 cup(Or for 2 medium sized pizza)I used cheddar cheese. Take a glass of lukewarm water(It means not too hot nor cool).Put sugar into it and stir.Then add yeast into it. Take a large bowl put flour to it.Add salt and milk powder to it. Keep this covered for 3 to for hours let it rise. When it is rose divide it into 2 equal portions.Make 2 balls with it.Roll them into a big chappathi. Heat your frying pan. Place this pizza base to it .Turn it after 2 mins.Turn the flame to simmer. Place mix of tomato sauce with red chilli flakes.Just spread it all over the pizza. Then place onion rings,tomato slices and chopped black olives.Spread grated cheese all over the pizza.Cover it and cook until the cheese completly melted.. Applying tomato sauce and red chilliflakes mixture. Placing onion rings and tomato slices. Spread grated cheese..Cover it and cook until it is melted.